The color orange cures the common cold. We’ve all been down since Friday with a nasty, hateful cold. Thankfully, the toddler seemed to have it the easiest this time around. Nate and I? We assume that, like hangovers, colds get worse as one approaches 30. A crate of mandarins, a crockpot full of beef stew, some chili gifted by a dear friend (when in doubt, give chili! ), and sooo much Sesame Street later, we’re all on the mend. When I’m sick, I get super-restless. I want to get up and move and do and go and make. 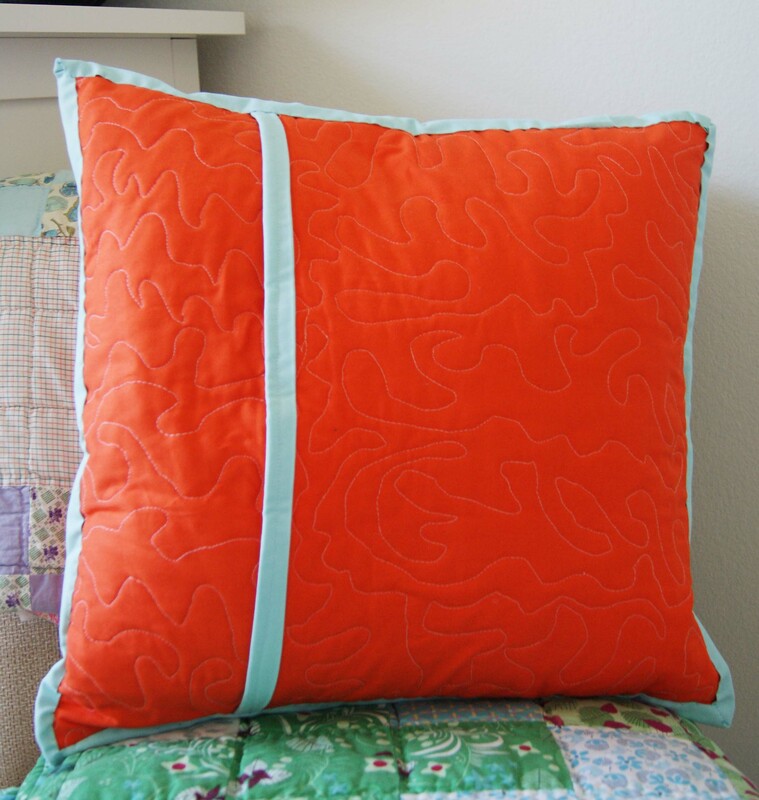 So this pillow went from pile o’ fabric and a book-cover inspiration to finished pillow rather quickly. This pillow is a few firsts for me: 1) first all-solid project: I’m entering it in the Pink Castle Fabrics Fall For Solids contest over at Threadbias; 2) first improv piecing: I’m MOST pleased with the way the design came together. Having just heard Alissa Haight Carlton speak about her quilts and her process definitely made this click for me! 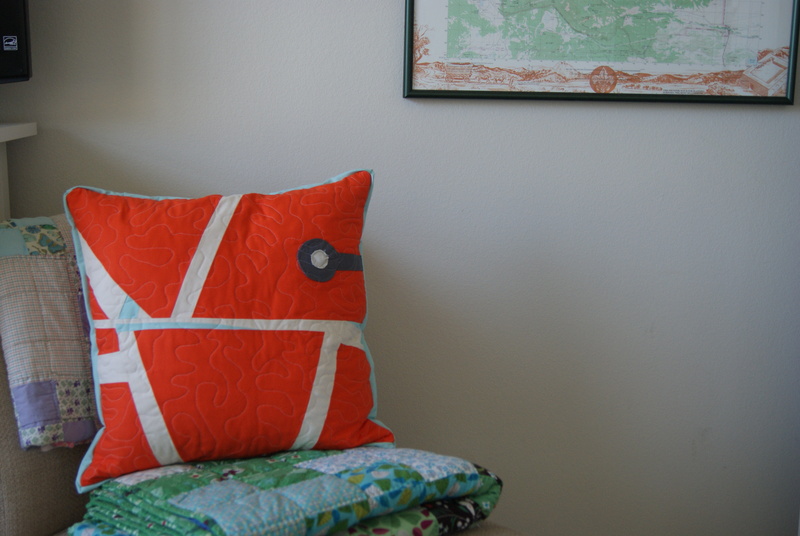 ; 3) first non-quilt inspiration: I didn’t see something on Pinterest, Flickr, or a blog and make a quilt just like it. I did it all myself! 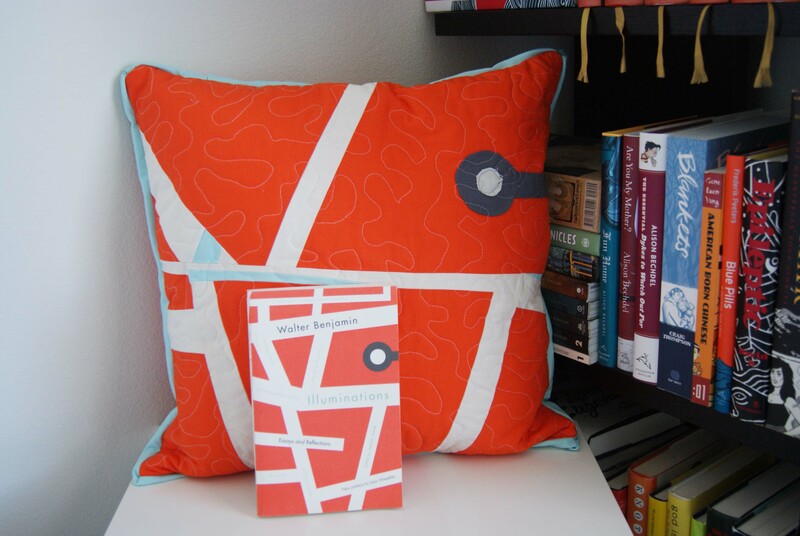 ; and 4) first binding on a pillow: ahem. I’m showing you the back because we’re all friends here and you won’t make fun of my crappy pillow binding, yeah? I tried to sandwich the binding between the front and the envelope back layers, which was bass-ackwards of me (should have put on the back, and then attached the binding…right? ), I did a crappy job tacking it down, my corners are sad, sad, and…to beat the band, I sewed the private layer on top of the public layer so I had a raw edge I had to try and bind off at the end. Even that I did upside-down, so I have the ugly shoulda-been-private side showing. Sick, congested, and fed up, I shrugged, refused to seam-rip, and am just going to enjoy it. Here it is with the book cover that inspired it, Walter Benjamin’s Illuminations. Honestly, I haven’t read any Benjamin since grad school, but that cover stuns me every time I walk past it on my back bookshelf. I think it turned out pretty neat, huh? Edited to add stats: 18” pillow cover. Konas: tangerine (yum), bone, aqua, coal. improv pieced, circle and “stem” off circle are machine-applique, bone inner circle is raw-edge applique. machine quilted, meandering. Thank you! I can’t take too much credit, since I ripped it off the book’s designer, but it turned out well. I’m glad you stopped by my blog. Thank you! I’ve got a bee in my bonnet about doing a Caps for Sale quilt (remember the children’s book from Reading Rainbow?) and now that I’m looking at the photos, I think a Craig Thompson pillow might be the ticket. A Harry Potter design maybe?